The Guess Who was the most successful Canadian rock group of the late 1960s and early 1970s, and Canada’s first rock superstars from Winnipeg, Manitoba. In the late 1950s, Chad Allan formed a band called The Silvertones with other Winnipeg teenagers, including bassist Jim Kale. Randy Bachman and drummer Garry Peterson joined in 1962, when the group’s name was changed to Chad Allan & The Reflections. Keyboardist Bob Ashley rounded out the five-man lineup, which changed its name to Chad Allan & the Expressions in 1965. When the band recorded a cover of the influential British hit “Shakin’ All Over” in 1965, Quality Records producer George Struth released it to radio stations under the name Guess Who? in the hope that DJs would bemore inclined to play a song by a mysterious new British band. The success of “Shakin’ All Over” led the band, now known as The Guess Who?, to tour with The Kingsmen, The Belmonts and The Turtles in the summer of 1965. Burton Cummings replaced Ashley on keyboards in early 1966 and Allan left a few months later, which made the 18-year-old Cummings the group’s new lead singer. 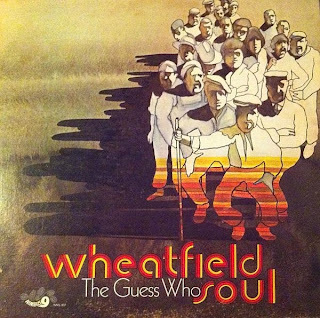 In 1968 released their fourth studio album "Wheatfield Soul". Producer Jack Richardon had mortgaged his house to finance the recording of the album, which contained the smash ballad "These Eyes", which sold over a million units worldwide and reached #6 on Billboard's Top 100 - instantly making The Guess Who a household name. This album is notable for being the first full-length "Guess Who" album to feature Burton Cummings on lead vocals and the first without original lead singer Chad Allan.